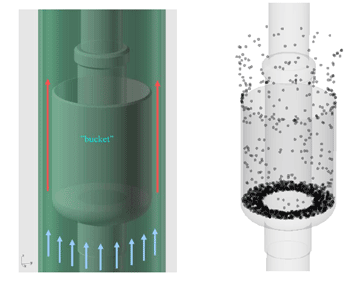 Left: STL model of bucket; Right: Numerical results showing 3D view of settling and settled particles. Courtesy of Narvik Institute of Technology. During the cleanup process in production pipes, dense particles may settle even if fluid is flowing upward. Devices can be designed to catch settling particles. A “bucket” centered in the pipe is one such potential device. Due to flow displacement, the upstream velocities outside the bucket are above settling velocities for high-density particles, corralling them inside the bucket. With the design shown, the upward fluid velocities around the bucket are higher than the particle-settling velocity. This makes it impossible for the particles to escape thorough the gap between the bucket and the pipe wall. Thus, none of the simulated particles passed the bucket to settle below.